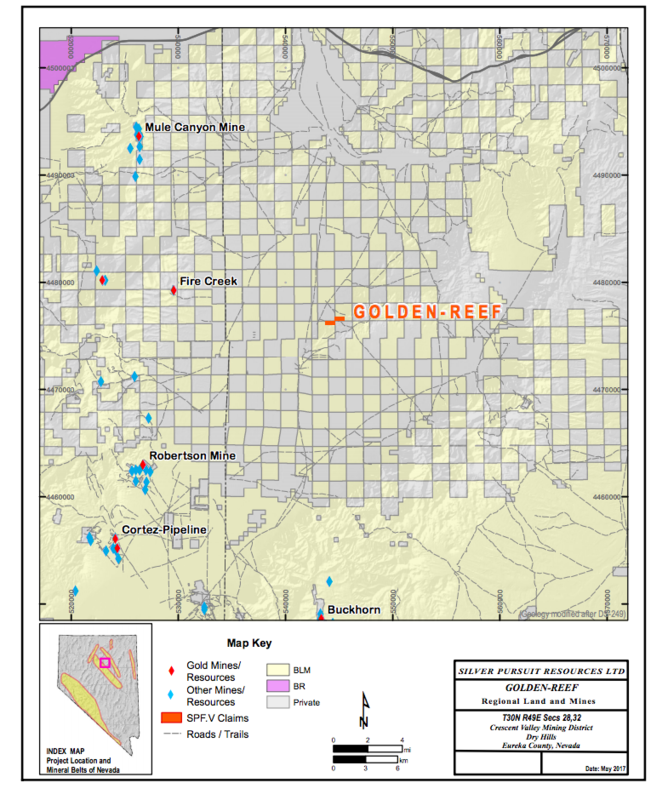 Eight, unpatented lode claims are located in diagonally-adjacent BLM sections on the east margin of Crescent Valley. The property is situated in the “Dry Hills”, a geographic feature jutting into Crescent Valley with a WSW-trend. The claims are eleven miles south of the settlement of Beowawe and seven miles easterly from the settlement of Crescent Valley. 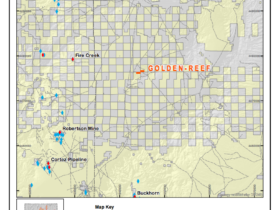 The Golden-Reef claims are 13 miles east, across the valley from the Fire Creek mine. The Cortez-Gold Acres/Pipeline deposits are 14 miles south of the claims. Elevations range from 4700 to 5600 feet (1432-1707 m) in the project area. Disseminated precious metals mineralization with associated feeder-zone mineralization along pre-Tertiary shear zones that are reactivated during Tertiary extension and volcanism. The property has been drilled in the past by at least two exploration groups, according to documents included in the BLM permitting records. A local prospector held claims in the area and excavated several trenches in the 1980’s. His claims were leased by Freeport and later by Santa Fe. A few drill holes were completed in the period from 1981 to 1987, but few detailed are known of this work. 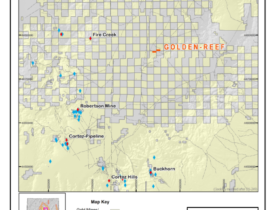 Coral Resources located claims in the area in 1989 and completed exploration trenching in 1993 that led to continued exploration efforts including drilling by associated small companies. Vasquir Mines began a more focused exploration program in the Dry Hills in concert with nearby exploration drilling that tested an intrusive-related target beneath valley cover in 2005. Vasquir (CQM Resources) completed 11 holes in the vicinity of the Golden-Reef claims and surrounding area. No results were reported in detail, but a press release dated November 19, 2007, by CQM, reported the best intercept was a 5-foot interval, in a deep zone, that carried 7.78 g/t. The company completed no further work after this drilling program. At the Golden-Reef claims, the Dry Hills are underlain by Pennsylvanian-age, Brock Canyon Formation which is intruded by Cretaceous rocks, mostly of intermediate composition. The older rocks are locally “capped” by Tertiary to Quaternary volcanic rocks. Three miles southwest of the claims, at the west tip of the “Dry Hills”, a young, hydrothermal system is evidenced by “fumarolic” alteration of Ordovician Valmy formation. The oldest map unit at the claims is the Brock Canyon Formation named for exposures of rocks twelve miles south, on the east side of Crescent Valley where the unit consists of clastic rocks, dolomite, claystones and arkose. At the type-section, twelve miles south, the Brock Canyon formation lies unconformably on the Ordovician Valmy Formation. The unit is representative of the “overlap assemblage” where detritus, eroded from the Antler highlands was deposited in shallow-sea environment. The Brock Canyon formation exposed at the Golden-Reef claims is characterized by poorly outcropping, fine-grained sandstones. Lower Cretaceous, intrusive rocks of varying texture and composition cross-cut the Paleozoic units. The following lithologies are subdivided by USGS-mapping in the vicinity of the claims: rhyodacite porphyry, fine-grained monzodiorite, granodiorite and albitized porphyry. Regional mapping suggests the Cretaceous rocks are of similar age and may represent differentiates of the same magma at depth. The field relations of the intrusives with the country rocks suggest forceful emplacement as evidenced by peripheral breccias to the intrusives and structural disruption of the proximal country rocks. Tertiary, rhyodacite flows and tuffs are exposed on the western portion of the claims. Locally, hydrothermal alteration is observed in the Tertiary rocks. 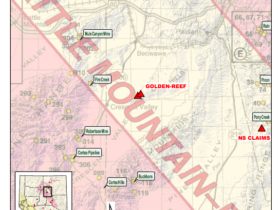 The regional structure in the Crescent Valley region has been the focus of much research because of the rich endowment of gold, in the Cortez and Cortez Hills districts, 14 miles south of the Golden-Reef claims. 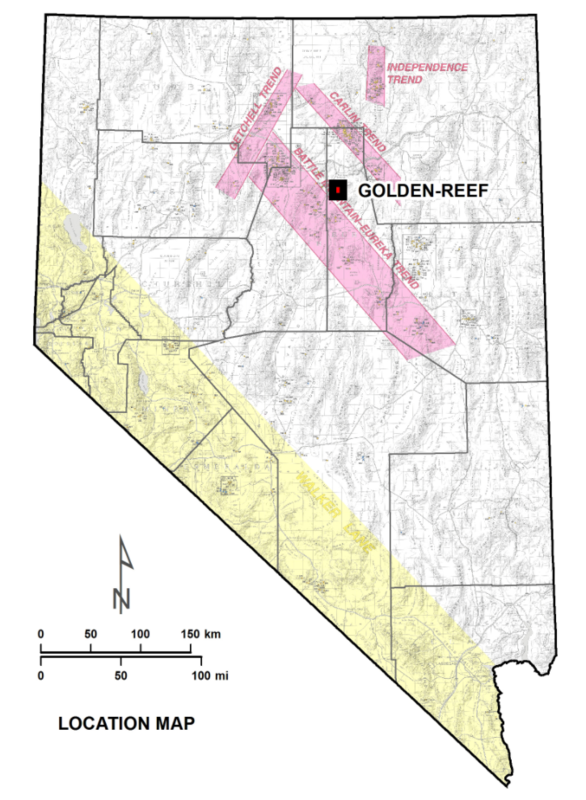 The nearest gold deposit, Fire Creek, is located on the west margin of the “North Nevada Rift”, the Golden- Reef claims are on the east margin. The local structural-grain at the property is defined by the east-northeast trending exposure of Paleozoic rocks and the intrusive contacts of the Cretaceous intrusive bodies. The Brock Canyon formation represents the overlap assemblage of rocks that are derived from upper plate rocks of the Roberts Mountain thrust developed during the Antler Orogeny of Late Devonian age. During Cretaceous time, the forceful emplacement of multiple, intrusive phases of the map units at the Golden-Reef claims resulted in brecciated margins of the country rocks. The intrusive bodies tend to have low-angle contacts in the region and shear zones developed are brecciated along the margins. It is thought that such zones of structural preparation are favorable for the localization of mineralization. 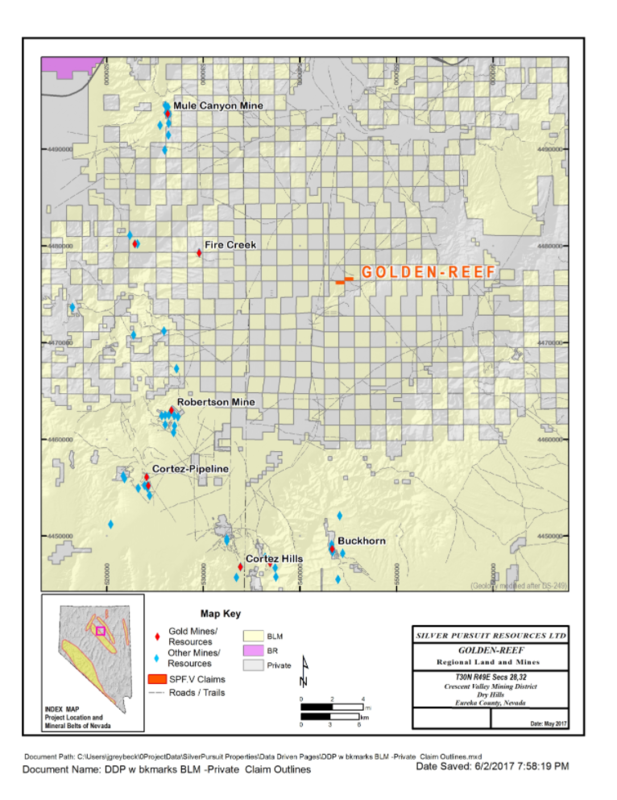 The style of mineralization at the Golden -Reef claims is not well-understood at this time. Past exploration is thought to have tested the potential for mineralization developed along the east-northeast, structural trend that controlled the emplacement of the Cretaceous intrusives of the Dry Hills. In the Fire Creek district, thirteen miles west, gold mineralization is hosted in Miocene volcanic rocks. 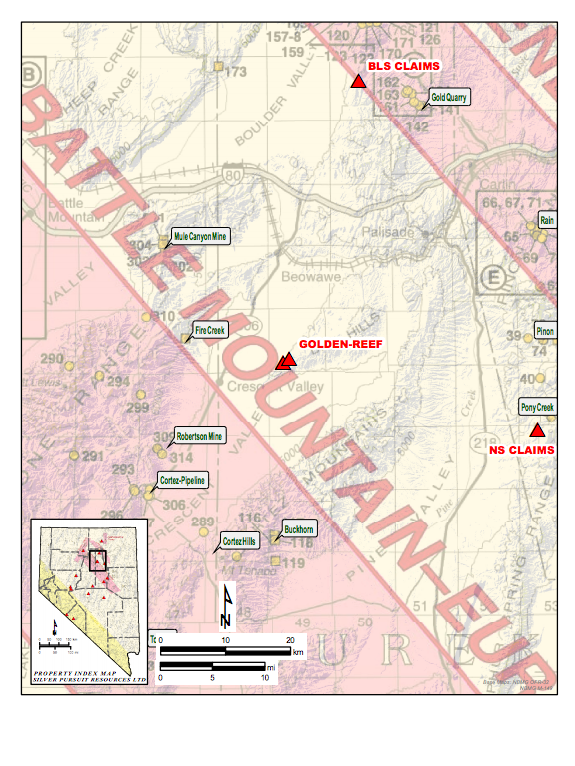 This mineralization is thought to be associated with the proximity to the Northern Nevada Rift and hosted in rocks nearly contemporaneous with the development of the narrow rift zone. The “Hot Springs Point” mine, located 3 ½ miles southwest of the claims is reported by the NBMG to have “fumarolic” alteration of pyroclastic rocks in contact with altered Paleozoic clastic rocks (Vinini Fm?). 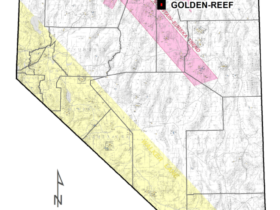 Geologic mapping of the rock units with an alteration overlay is planned for the Golden-Reef claims. Rock chip sampling is planned to characterize the style of mineralization. Trenching is proposed to expose the mineralization previously identified on the claims. A ground-based magnetic survey is proposed to identify zones of hydrothermal alteration.